Scott Fitzgerald gave jazz a scope beyond its ambition when he coined the term “Jazz Age”. 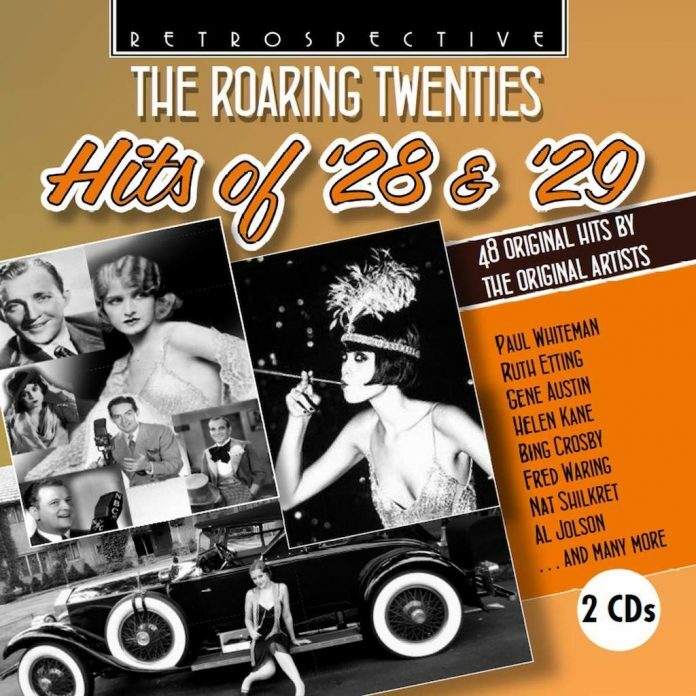 Those who did most of the roaring in the Roaring Twenties were not particularly interested in jazz as such, only the milieu of which it formed a relatively small, intense and slightly displaced power source. It was ever thus: flappers and their fashion-followers were, in terms of musical tastes, the 1920s middle-of-the-roaders. Not the least of Fitzgerald’s offerings to posterity was the implication that what his small coterie did was what everyone was doing. What he understood as jazz may not have been shared by jazz musicians. Some of these issues are reflected on this double album. It’s a narrow area of interest – the final two years of Fitzgerald’s “lost decade” – but the collation by Retrospective’s Ray Crick, with the position reached by the songs in the hit parades of the day, demonstrates how musically busy it was. The place of jazz in this arena of primarily songsters was typified by Paul Whiteman, its self-styled “King”, whose “Among My Souvenirs” was a number one hit in 1927-28. He “wore” a plastic crown and may privately have dismissed the monarchic title, but he knew where the fire was most intense in having Bix Beiderbecke and Tommy and Jimmy Dorsey on the pay roll. Jazz permeates a lot of these charts, albeit illustrating by default that the treatment by jazz musicians of standard songs from music theatre and elsewhere was not as popular as those versions by performers more besotted with the originals. “You’re the Cream in My Coffee”, from the Henderson/De Sylva/Brown musical Hold Everything!, and performed by violinist Ben Selvin and his Broadway Nitelites, is a good example. Selvin didn’t need pure jazz. He was prolific because his band performed the same kind of stuff under pseudonyms. Al Jolson was vaudeville, his “There’s a Rainbow ‘Round My Shoulder”, by Dreyer & Rose from the film The Singing Fool, a number one hit and the flipside of “Sonny Boy”, no less. Louis Armstrong and Ben Pollack are here, but also Maurice Chevalier and Eddie Cantor. This is not a survey of jazz; it’s a survey of the end of a decade in which jazz was preparing to enter a new and bountiful period. There’s not even a suggestion that much of the music had its source in pure jazz. It’s as complicated a historical picture as Crick’s assemblage is technicoloured, even given that several musicians make more than one appearance. Jazz devotees need to take in the wider picture. Paul Whiteman, Guy Lombardo (cond); Rudy Vallee, Gene Austin, Ruth Etting, Helen Kane, James Melton (v); and others. "This is not a survey of jazz; it's a survey of the end of a decade in which jazz was preparing to enter a new and bountiful period".